Violence, and Rule of Law. methodology and analytical framework for this study. last section is conclusion and policy implications. indicators is computed by means of Pearson’s correlation. 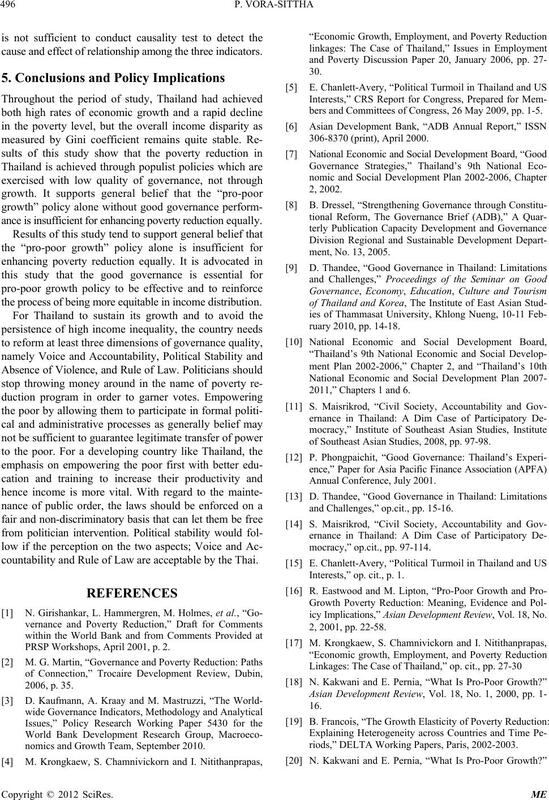 represent growth rates for the Thai economy3. causes of all poverty within our societies . veys of government officials, bu sinesses and households. most reliable indicators to date. the society: public sector, private sector and civil society. that govern economic and social interactions among them. 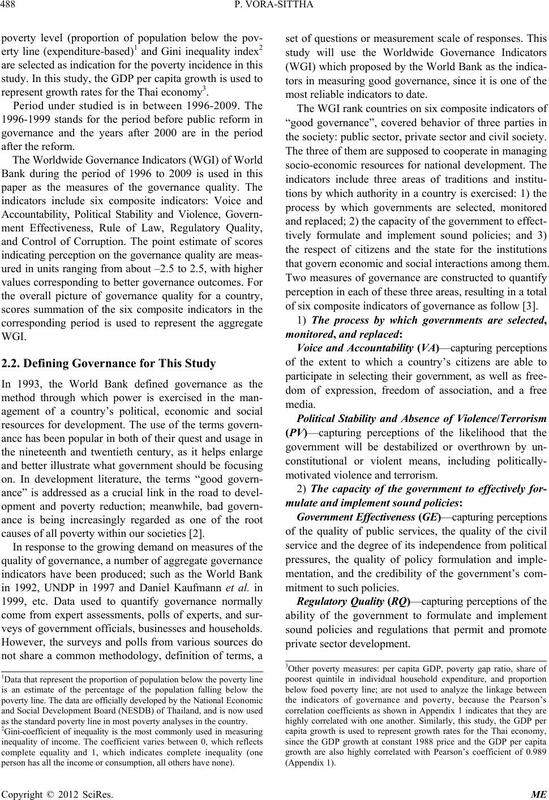 of six composite indicators of governance as follow . as the standard poverty line in most poverty analyses in the country. erson has all the income or consumption, all othe rs have none). well as the likelihood of crime and violence. is insufficient for enhancing poverty reduction equally. Asia and is considered as a newly industrialized country. times of its level in 1951.
were among the worst hit millions lost their jobs. 1996 to 40.00 in 2009 (Table 1). head of government and the King is the head of state. separately elected senators and anti-corruption institutes. government but is still unsatisfied to date. factor for restoration of temporary political stability . faced the economic and the financial crisis in 1997-1998.
penditure- based) (%), **The GDP is at Constant 1988 Price. resilient and adaptable than others to the Asian Crisis. led to greater use of discretionary judgment by officials. in the local business sector and the whole economy . ment Commission was established on October 3, 2003.
ess in the public sector. change and are unable to provide justice for all parties. 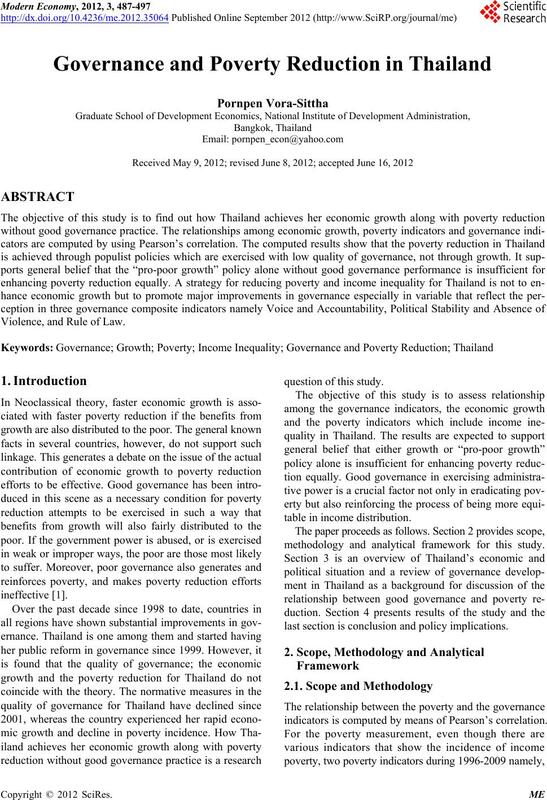 stacle to the spread of good governance in Thailand. which targeted at good governance through constitution. The constitutional reform, however, do not totally fail. and the laws that govern through public consultation and negotiation. Table 2. The scores of governance indicators. the bureaucrats to abuse their position for personal gain. principles of goo d governance. have continued to disrupt the country since then . results are consistent with the study of Krongkaew, et al. Table 4. 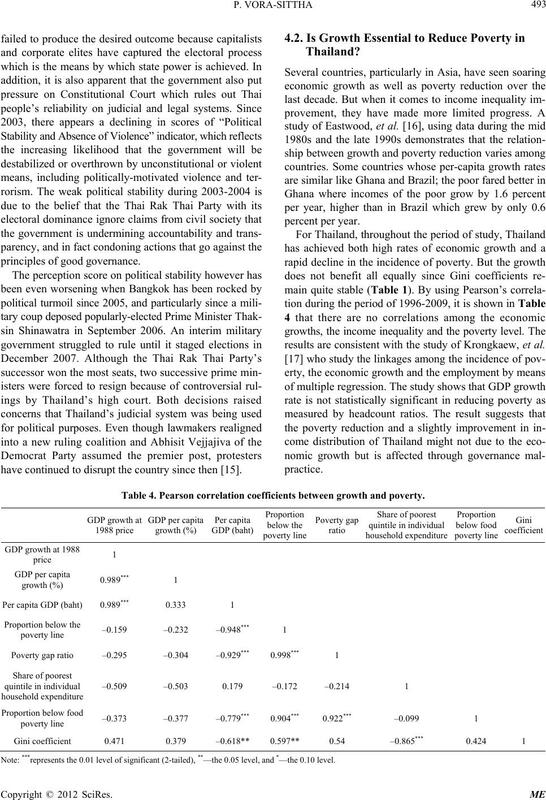 Pearson correlation coefficients between growth and poverty. Note: ***represents the 0.01 level of significant (2-tailed), **—the 0.05 level, and *—the 0.10 level. poor relatively more than that of the non- poor. tain periods like 1992-1994, 1994-1996, and 2000-2002.
their homes and other assets and operating businesses. reduce poverty on ly when th e type of growth is pro- poor. could help pul l the po or out of poverty. channel income or in-kind payments to them. the aggregate score of World Governance Indicator (WGI ) . governance tend to reinforce poverty in the society. 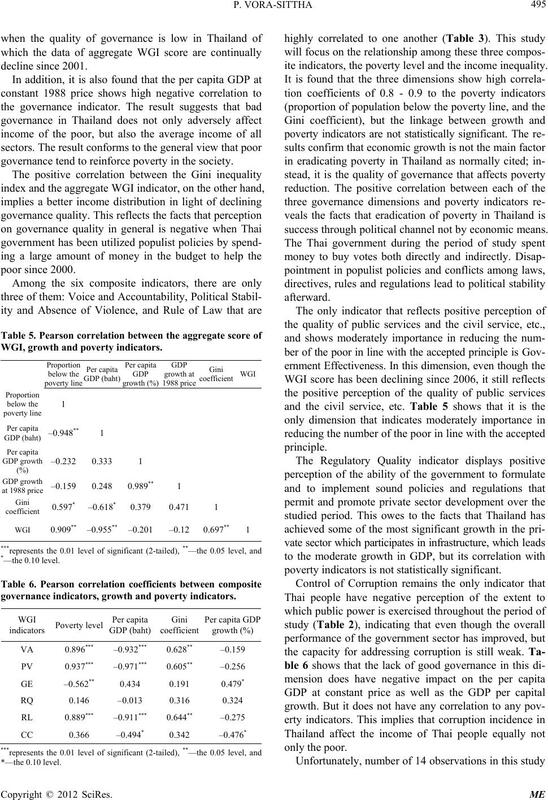 WGI, growth and poverty indicators. 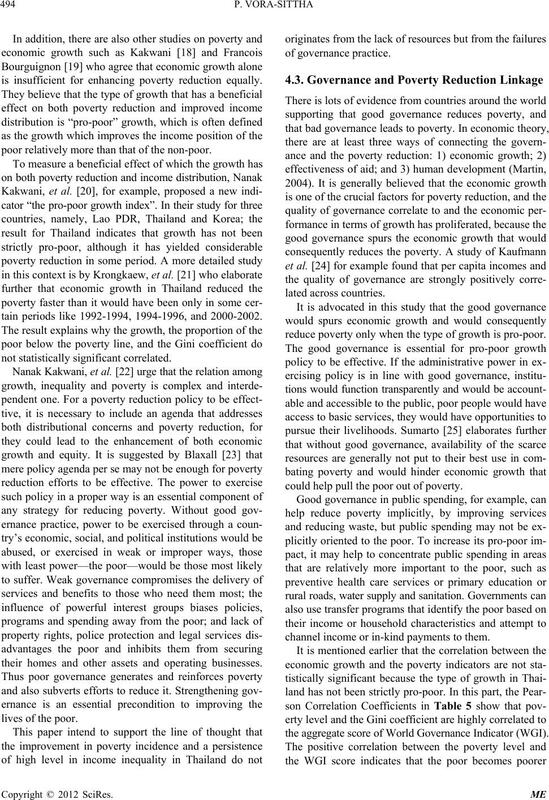 governance indicators, growth and poverty indicators. ite indicators, the poverty level and the income inequ ality. success through political chan nel not by economic means. poverty indicators is not statistically sig nificant. cause and effect of relationship am ong the t hree indicators. ance is insufficient for enhancing poverty reduction equally. the process of being more equitable in income distribution. countability and Rule of Law are acceptable by the Thai. PRSP Workshops, April 2001, p. 2.
nomics and Growth Team, September 2010.
bers and Committees of Congress, 26 May 2009, pp. 1-5. 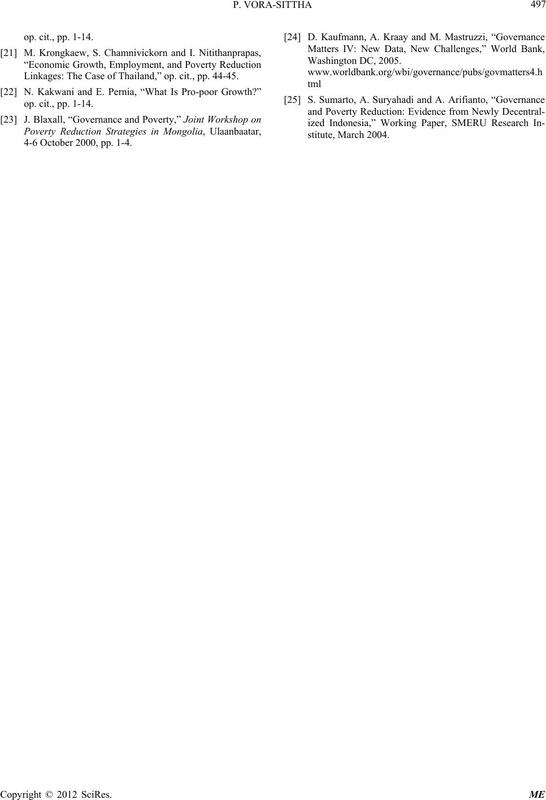 2011,” Chapters 1 and 6.
of Southeast Asian Studies, 2008, pp. 97-98.
and Challenges,” op.cit., pp. 15-16. Interests,” op. 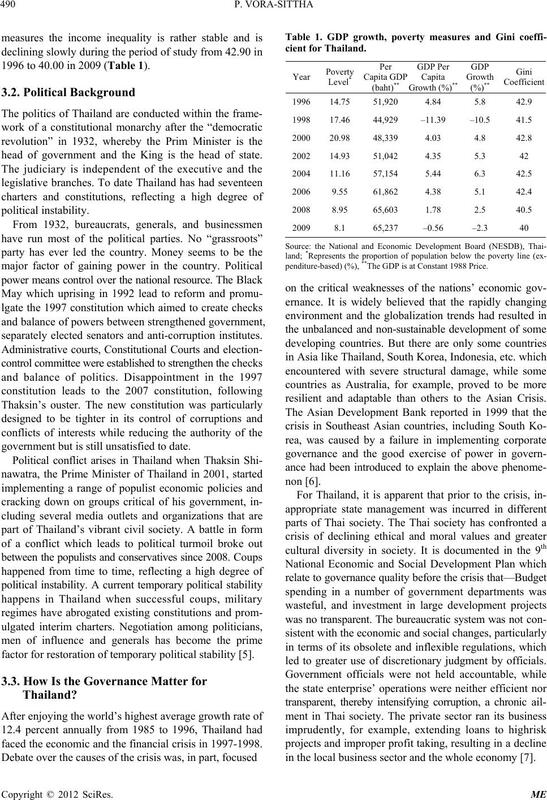 cit., p. 1.
icy Implications,” Asian Development Review, Vol. 18, No. riods,” DELTA Working Papers, Paris, 2002-2003. Linkages: The Case of Thailand,” op. cit., pp. 44-45. 4-6 October 2000, pp. 1-4.